Nonprofits that raise funds from the public must comply with charitable solicitation registration requirements. Charitable solicitation is regulated at the state level, and the requirements vary by jurisdiction. 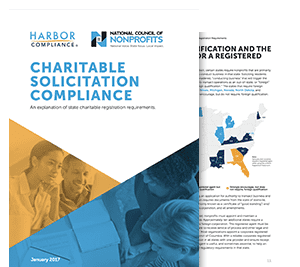 Forty-one jurisdictions currently require nonprofits to register to solicit their residents, and 25 require certain information be disclosed on solicitation materials. This guide provides an overview of the steps you’ll need to take to maintain compliance nationwide. First and foremost, charitable solicitation registration requirements are law, and as such, should not be taken lightly. Beyond that, donors care that the organizations they give to are doing all they can to be transparent about their fundraising activities. The rise of charity rating websites (View our page on charitable solicitation compliance hosted by Charity Navigator) gives credence to the fact that donors expect accountability from the organizations they give to. The internet has made it simpler than ever for prospective donors to investigate organizations prior to giving, and charities bureaus offer searchable databases of the entities registered in their jurisdictions. Organizations that register for charitable solicitation join the ranks of the most trustworthy groups out there. Becoming licensed engenders trust from donors and sets the applicant apart from the crowd. Compliance can and should be a badge of honor. The requirements, while complex, present an opportunity for organizations to demonstrate how serious they are about protecting their donors and ensuring their conduct is beyond reproach. Public trust is the most important currency for any nonprofit, and the foundation of that trust lies in complying with state laws. Nationwide compliance is a license to fundraise without inhibition. It provides peace of mind to fundraisers and opens doors to future campaigns no matter the venue or format. Additionally, many grant applications and other sources of funding can only be applied for after the charitable registration has been completed. Having these registrations in place beforehand allows groups to nimbly respond to grantmakers’ requests and avoids disqualification. Charitable solicitation registration can be a daunting task. Diverse requirements across jurisdictions, competing deadlines for renewals, and ever-changing legislation make it difficult to stay ahead of the curve. That said, the investment is well worth it. Generally speaking, this is the simple act of asking for something of value. It can take many forms. Conventional examples include fundraising events, direct mail, phone calls, emails, and radio and television ads. Also, online fundraising via a “Donate” button on your website or through social media may constitute charitable solicitation. Other common methods include applying for grants or collecting membership dues. Known colloquially as fundraising registration, this is the process by which a nonprofit becomes licensed to solicit funds in a jurisdiction with charitable registration requirements. It involves submitting paperwork to the state charities bureau, usually managed by the state attorney general or secretary of state. Forty-one jurisdictions have registration requirements that are triggered by solicitation. The remaining 10 do not require registration per se, but some do require disclosure statements to be included on solicitation materials. In total, 45 jurisdictions have some form of regulation related to charitable solicitation. Solicitations made by the nonprofit on its own are the most common reason for registering. However, solicitations made through professional solicitors, fundraising consultants, commercial co-ventures, charitable gift annuities, or games of chance not only trigger charitable registration requirements, but may require additional licensing. These registrations are designed to protect donors from illegitimate organizations fraudulently soliciting funds for non-charitable causes. Additionally, they protect the charitable community from the negative publicity illegal solicitors create. Completing registration applications generally involves submission of the jurisdiction’s specific form, a filing fee, and supporting documentation. Applications typically must include the organization’s IRS Determination Letter, IRS Form 990, and a list of officers and directors, among other items. Fees vary by jurisdiction and are often calculated based on total gross revenue in the previous year or amount of contributions received in the jurisdiction. Permission by a jurisdiction for certain entities to avoid filing typical charitable registration applications. Organizations that qualify for exemptions must generally submit an exemption request or other paperwork in place of the typical application. Exemptions may be granted based on organization-specific factors. For example, if an organization’s annual contributions do not meet a given jurisdiction’s threshold for requiring registration, the group would not need to file an application. Another determining factor would be the methods of solicitation the organization uses. Special exemptions may also exist for specific religious, educational, political, governmental, fraternal, membership-based, or healthcare-related organizations. In many jurisdictions, certain groups can be exempt from registration, including those that receive less than a certain amount of contributions annually. Exemptions themselves typically require an application and also require renewal on an annual basis. As a result, exemptions may reduce an organization’s filing fees but will not necessarily lighten its workload. Organizations that file exemptions still face the challenges of tracking changing jurisdiction requirements, preparing applications, managing renewals, and monitoring fluctuations in annual contributions. In 25 jurisdictions, charities are required to include disclosure statements on their solicitations. The specific required language varies by jurisdiction. Generally, disclosures inform donors where to obtain more information about a nonprofit, either from a government agency or from the organization itself. Disclosures typically must be included on any written solicitations, including the organization’s website if they’re soliciting online. Like the initial application for charitable registration, these forms need to be submitted at regular intervals to keep the charities bureaus apprised of changes in a registrant’s status and financials. Their due dates vary by jurisdiction but are generally based on some number of months following the close of the registrant’s fiscal year. For example, a registrant may be required to file 4.5 months following the close of their fiscal year. Charitable solicitation registrations must be renewed, typically on an annual basis. Like initial registrations, renewal applications involve a specific form and supporting documentation. However, the application process and fee structures are often different than those used in the initial registration. Organizations can expect to file their most recent financial information with their renewals, which is typically the Form 990 and audit. Some jurisdictions require organizations to provide organizing documents and bylaws each year, while others require that they be submitted only once. Each jurisdiction requires renewal applications to be submitted at different times throughout the year. Four months and 15 days after the close of an applicant’s tax year (May 15 for organizations on a calendar tax year) is a common renewal date. Keeping track of varied due dates is one of the major challenges of charitable solicitation compliance. Similar to the IRS Form 8868 extension some organizations file on their 990 tax return, these forms allow applicants to push back the deadline of charitable registration renewal applications. Since states require information from the 990 to be included on the renewal application, extending the due date of that filing will be necessary whenever the return is not available before the regular due date. For organizations that have a calendar tax year, renewal deadlines of May 15 pose an additional challenge, since that is the same day that Form 990 is due to the IRS. Larger organizations tend to struggle to meet state charitable solicitation renewals and IRS deadlines. The 990 and financial audit often are not ready in time for the applicant to file renewals by the regular deadline. In these cases, it is necessary to file an extension with each jurisdiction in order to stay in good standing. The process of filing for an extension varies in every jurisdiction but often includes submitting a copy of IRS Form 8868 to the charities bureau. Most jurisdictions require organizations to file initial and renewal registrations by paper. A handful of jurisdictions require online filing, and more jurisdictions are transitioning to using an online system. Some jurisdictions allow charities to file by email or fax, but for large organizations, these methods tend to be more inconvenient than sending a packet by mail. The ubiquity of the internet allows tax exempt entities to solicit funds worldwide at the click of a button. It is a tremendous opportunity for many, however it also poses unique compliance challenges. Donors can access online solicitations anywhere at any time. Since registration requirements are triggered by the act of soliciting and not by the receipt of funds, simply displaying the option to donate on an organization website, social media page, or giving day page generally triggers registration requirements everywhere. A legal appointee located within a given jurisdiction intended to receive service of process deliveries and other legal or government notices on behalf of a legal entity. State law requires that all entities have one listed in their formation documents on state record, but appointments for other purposes, such as licensing, are common. The process by which a certificate of authority is retrieved from another jurisdiction. It is required prior to transacting business in a new jurisdiction for the first time, and it involves the appointment of a registered agent in the secretary of state records. For example, an entity formed in Delaware that wishes to open an office in the Pennsylvania would need to first secure a certificate of authority and appoint a registered agent in Pennsylvania’s state records. Permission by a jurisdiction for certain entities to avoid paying franchise or business taxes. It is automatic for 501(c)(3) entities in most states. However, others may require an additional filing to avoid having to pay. Foreign qualification triggers tax requirements in most jurisdictions. To avoid having to pay the tax, the entity would file for the exemption following foreign qualification. Four jurisdictions require charities to register as a foreign nonprofit corporation with the secretary of state. This process is referred to as foreign qualification. Foreign qualification involves filing an application for authority and appointing a registered agent. The registered agent must be located within the jurisdiction and is responsible for receiving service of process and other legal documents on behalf of the organization. 11 jurisdictions may require nonprofits to list a registered agent on their charitable solicitation forms but do not require qualification with the secretary of state. What does it take to be compliant? An explanation of increasingly complex state charity requirements. 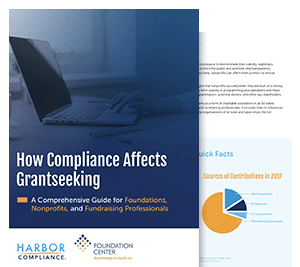 Learn what grant makers and grantseekers need to know to ensure compliance. Revised January 04, 2018. Complete data last reviewed January 04, 2018. We provide a full range of charitable registration and compliance services. Learn how we can help your organization.